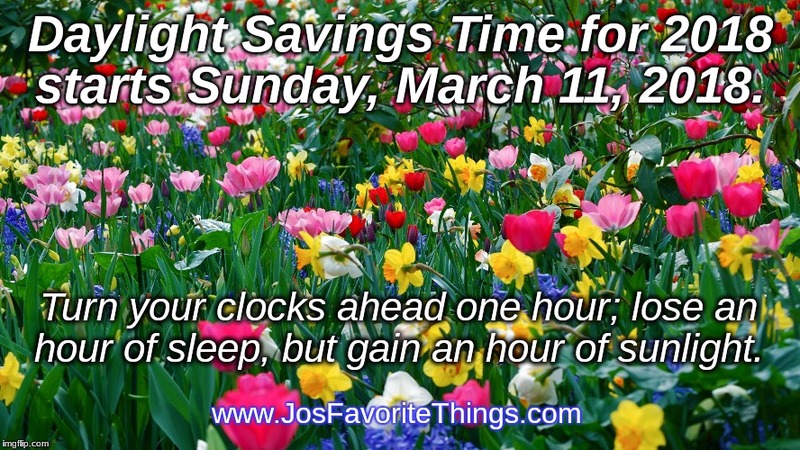 Jo's Favorite Things: Daylight Savings Time for 2018 begins Sunday, March 11th! Daylight Savings Time for 2018 begins Sunday, March 11th! We've noticed earlier evenings even though we've had many grey days lately: When it is sunny out, it is still light until after 5 p.m.
We Spring Ahead! Daylight Savings Time in 2018 starts Sunday, March 11th. We need to move our clocks ahead one hour on Saturday night and we get one less hour of sleep, but it will seem worth it when we notice that we can still see our hands in front of our faces at 7 p.m.! Enjoy! So: Turn your clocks FORWARD Saturday night, March 11th, before you go to bed. Spring ahead!! How Many Days and Hours Until Daylight Savings Time? Click HERE!